(1) A Norton Commando. Not some new version that I keep hearing about, but a legit, original, 1970s model. From the very first time I saw this bike, I fell in love with it. But Santa, which model should I ask for? I’m far from the Norton expert, but I’m told that many people consider the 1974 MKIIA the “best.” This was the most developed model before the manufacturer integrated a lot of the modern changes, like an electric start, rear disc, left-side shifter, etc. A lot of those changes were not well received. The thing is, I like some of those things. I mean, a kick starter is cool, but my 1979 Harley Sportster XLC had a kick start, and that thing was awful. On days when she got in a mood, that kick starter could snap back and darn-near tear your knee off. And didn’t the pre-1975 Nortons have a right-side shifter? That’s kind of nifty, but I think it would take some serious getting used to. Okay Santa, I’ll tell you what. Dealers choice. Put a Norton under my tree, and I promise I won’t complain about whether it’s kick or electric, left shift or right eclectic. (2) A new engine for my Harley. Last fall, as I was riding home from a Confederation of Clubs meeting in San Diego, my 2004 Harley Davidson Sportster began making the most awful noise I’ve ever heard. It sounded something like value clatter — through a mega-phone. The performance immediately dropped, and I putted along to a friend’s house who lived close to where I was (in Orange County). The following week, I learned that a pin broke, my connecting rod bent, and my rear cylinder got scored to heck, and now the bottom end is even all jacked up. The bike is still sitting in my brother’s garage, waiting for a much-needed rebuild. 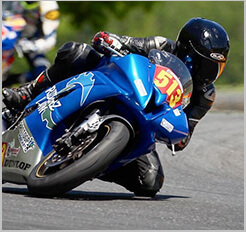 Since then, I’ve been riding my old Suzuki GSX 1100g. It’s a fine bike, but it’s just not the same. So how about a new engine, Santa? Or maybe even a brand new Harley. After all, I’m a grown-up now. Maybe it’s time to graduate to a Big Twin. (3) My old motorcycle jacket. For about a decade, I wore the same motorcycle jacket. It was a black, cafe-style, off-brand leather jacket, that I found in a little boutique in San Francisco during my first year of law school. As soon as I saw it, I knew it was me. It fit perfect, looked great, and the leather was thick but comfortable. I’ve owned and worn other jackets since buying that one, but that was THE one. It was the jacket I was wearing when some uninsured idiot made an illegal left turn in San Francisco, cutting me off, totalling my bike, and sending me, by ambulance, to the emergency room at San Francisco General. I wouldn’t let the EMT’s cut it off me, and after the motorcycle accident, the jacket pretty much looked unharmed (despite the fact that I tore all the ligaments out of my right shoulder and busted up my right knee). I loved that jacket. But this past November, someone stole if from my bar stool at a divey little place in Pittsburgh. My new jacket just doesn’t feel the same, and doesn’t look nearly as cool. If you can find it, Mr. Clause, how about getting me my old jacket for Christmas this year? (4) A pair of MP3 sunglasses. I am not into new technology. I was the last guy on my block to get a big screen LCD television. I don’t have an iPhone or a Droid phone, and I still haven’t quite figured out what Twitter is, or why anyone would want to read every inane thought that someone has, regardless of how famous they are. But these MP3 sunglasses are cool. They have little built-in speakers so you can listen to music while you ski or ride a motorcycle. And yeah, I get that blasting music into my ears while riding probably isn’t the safest idea. And I promise that if I get them, I won’t use them in heavy traffic, or whatever, but seriously, what would be betting than listening to Springsteen (or whoever you happen to like) while ripping through the twisties? For those of you who argue for the golden sounds of silence, well hey, I agree. A lot of the time. But sometimes, tunes could really make a long ride that much better. If nothing else, it has to be better than when I get some God-awful pop song stuck in my head for 200 miles. “Don’t you wish your girlfirend was hot. Like. Me. Don’t cha?” I mean, how do I even know that song??? And the more I try not to think about a bad song, the more it gets stuck in my head. And in my own voice, it’s even worse. So seriously, Santa. Save me from myself. I’ve provided a link for you here. So there it is. A simple list, from a man with simple tastes. Santa, or whoever loves me and needs some gift ideas, I’ve given you quite a selection from which to chose. It’ll be hard to sleep tomorrow night, wondering just what wondrous present is waiting for me. Will it be an old Norton, a new Harley, my stolen jacket, or the simple joy of a song that I’m not singing to myself? 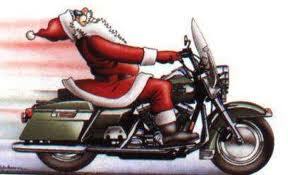 From all of us at Riderz Law, here’s hoping you all get what you want this Christmas. Really, if you are lucky enough to spend the holiday with loved ones, what more could you ask for? Merry Christmas, ride safe, and stay sunny-side up this holiday season.